How I came to write Opting Out? High-achieving professional women who've headed home to care for their children full-time have been the subject of recent media frenzy, but my scholarly interest in them predated their media moment. My interest was piqued when, through participant observation (otherwise known as life), I discovered in the school hallways, on the soccer fields, and during all the down time of motherhood that a lot of the women I knew in my suburban hometown as "just moms¨ had once led very different lives. These lives included degrees from top schools and prestigious careers as lawyers, doctors, executives, editors, and the like. As high-flying professionals, these women enjoyed advantages and a level of support unavailable to most working women both at home and on the job. Moreover, their track records attested to past ambition and significant work commitment. Why, then, were they leaving their careers behind? The obligatory literature search yielded few answers. This particular group of women, having exited the labor force, appeared to have gone missing. I undertook a two-part study to try to address this research gap: first, to better understand the larger contours of this phenomenon and second, to shed light on the circumstances that led women to take this step. My analysis of labor force trends using CPS data going back several decades revealed that, media messages to the contrary, there is no "opt-out¨ revolution. Nonetheless, the media attention wasn't going away (if anything, it was increasing), and case studies suggested that leading firms and professions were experiencing retention problems among their rising female stars. This led me to carry out an in-depth, qualitative study of 54 high-achieving women living in several major cities across the U.S. who fit the profile of the media depiction (white, married women with outstanding educational credentials who had formerly worked as professionals or executives but were now full-time mothers). Results from this study correct another media misperception: I found that workplace pushes play an equal and arguably stronger role in women's decisions to quit than family pulls, and that what looked like a "choice¨ (and, indeed, was understood as such by women themselves) was often far from it. With much-appreciated support from the Sloan Foundation's program on The Workplace, Workforce and Working Families, directed by Kathleen Christensen, I completed this study and wrote my book based on it, entitled Opting Out? 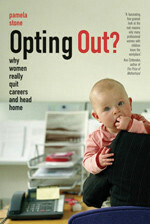 Why Women Really Quit Careers and Head Home (University of California Press, 2007). The book documents the double-bind faced by women in the "gilded cages" of elite professions and the existence of a significant "choice gap¨ In it, I explore not only women's reasons for interrupting (and in some cases terminating) once-flourishing careers, but also their re-invention as at-home mothers and their re-direction away from their former careers, many in favor of historically female professions such as teaching. I discuss the policy implications of my results and present case studies of firms that have been especially responsive to the needs of high-achieving women professionals in the current economic and organizational climate.